A Saxon nun, Roswitha (Hrotsvithæ) of Gandersheim (ca. 935-ca. 973) was Germany's first poetess. She wrote plays about strong, fearless, wise, virtuous women, and poetry in Latin. Manuscripts of her plays were discovered in Nuremberg in 1501 by Ludus Dianæ. 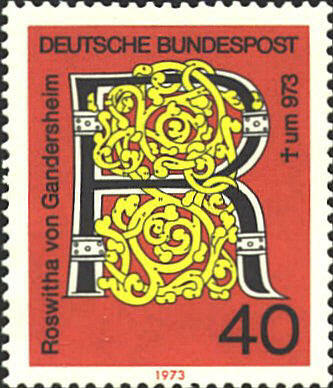 The illuminated "R" is for Roswitha.